My first piece of published fiction. This is my first piece of published fiction. 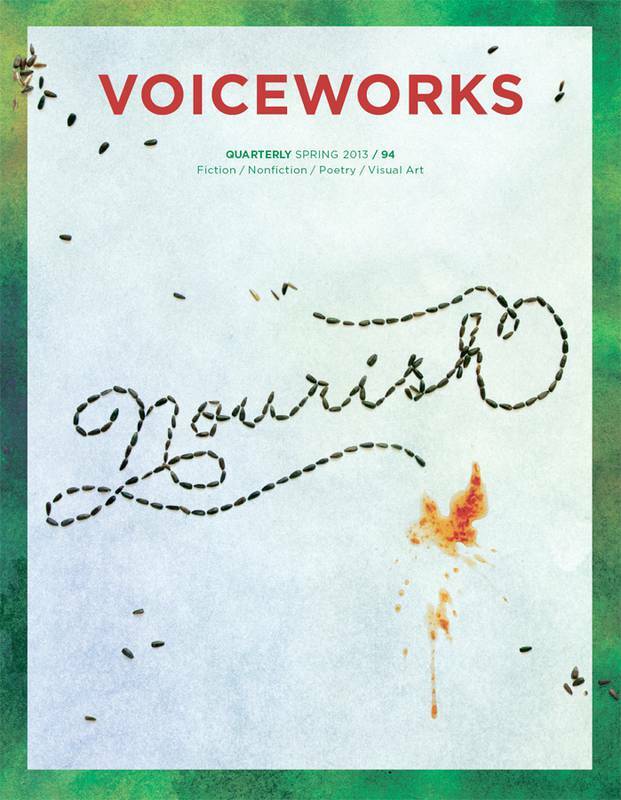 It appeared in issue 94 of Voiceworks magazine, in Spring 2013. It’s called Bronte. I wrote about the experience of being published here. They named her Bronte, unable to decide between Charlotte and Anne. ‘A windswept name,’ thought Rebecca, with the exhilaration of someone about to do something not quite sensible. Bronte slithered out from between Rebecca’s thighs, cold and wet, with a thatch of dark hair plastered to her face. She lay gasping like a dying fish until the doctor wiped the mucus from her mouth and smacked her smartly on the back. When she was five years old, she leapt off the roof of the house, landing in a sticky tangle of thorns and snapping her collarbone. When Rebecca and John asked her what on God’s green Earth she had been thinking, she blinked at them and said ‘I was thinking I wanted to die.’ Rebecca and John sent her to a variety of doctors who sifted through her mind to no avail, until Bronte told them exasperatedly (and with extraordinary articulation for her age) that she hadn’t really wanted to end her life, she was just curious to see what dying felt like. John wondered about her. Rebecca chewed her nails, and doubted. When Bronte was seven years old, her younger brother Joseph was born. He was blond and fair with rosebud lips and beautiful, fat-baby limbs. Bronte held her own skinny wrists up to compare, saw the sallow shade, almost blue – the colour of a sickly oyster. Joseph had cream-coloured skin, fresh and blooming with health, and Bronte stroked the downy crown of his head, wondering if Joseph too, was curious to know what dying felt like. Rebecca lifted the baby away, into the cot, a flutter of muscles shifting beneath the skin of her forearm. When Bronte was eleven years old, Rebecca’s mother came to live with the family. Grandma Joan had a brain tumour that was killing her slowly and creatively, playing dice with her senses and nerve impulses. Rebecca felt bloated with the richness of who her mother used to be. First, Grandma Joan’s short-term memory went, slipping quietly out the door one night and blending seamlessly into the detritus of the summery storm. Next, it was her ability to chew her food. Rebecca sat up next to her, five times a day with a cloth and a bowl of pureed slush. She developed a rhythm. First, you spoon into the open mouth, then massage the jaw and throat gently, ensuring the food is swallowed without incident. Then use the cloth to wipe the saliva and partially masticated mess off the lips and chin. Spoon, massage, wipe. Repeat. Bronte sat beneath the dining room table, transfixed, and Rebecca fought the urge to scream at her to go away. But she didn’t, and Bronte wouldn’t. One morning, Bronte crawled up to Grandma Joan and held her nose and mouth pinched shut with her thumbs and forefingers. Rebecca came into the room just as Grandma Joan turned blue. The slap on Bronte’s cheek turned into a perfectly formed five-fingered bruise. Grandma Joan died not long afterwards, anyway, when her heart puttered to a long overdue stop. Rebecca cried for days and it was up to John to cook dinner for Bronte and Joseph. Bronte marched her peas around the edge of the plate and used her fingers to flick them neatly at Joseph. Joseph roared with laughter, his chubby fists beating the table with enthusiasm as he tried to catch them in his open mouth. Rebecca howled from the next room. Bronte woke up the morning of her thirteenth birthday with Grandma Joan sitting on her chest. She tried to yell, but all that came out was a flattened gasp. As she struggled, Grandma Joan leant forwards, eyelids drooping, looking for all the world like she was falling asleep. Chewed food dangled from her lips on strings of drool and Bronte gave an almighty shove right as the longest string snapped. Grandma Joan toppled backwards off her chest and disappeared. Bronte sat up and looked around the room, afraid to move, her breath coming in great lungfuls. Words sat on her tongue, scrambling forwards before she gulped them back again, weighing her options. She thought it better not to bother her parents and besides, her mother tended to tighten her lips when Bronte mentioned Grandma Joan. The next morning, when Grandma Joan appeared again, Bronte didn’t panic. ‘Hi Grandma Joan,’ she said, easing herself out from under her and waiting to see if she would disappear. Grandma Joan nodded and tried to answer, but her words came out garbled like they had in the last few months of her life. Bronte frowned. Surely death would have brought some form of relief from life and the pain that came with it? When Grandma Joan appeared once more, several days later, Bronte was still unable to understand her. Instead she sat on the edge of her bed, her toes freezing as she watched the ghost of her grandmother articulate something Bronte couldn’t grasp. Bronte made a fist and rapped herself on the skull a few times, but nothing happened, apart from an annoying pain in her head. By the time Bronte was fifteen, Rebecca had shut down. She spent all day in bed, emerging only to use the bathroom and sometimes not even then. John would carry the soiled sheets from the bedroom to the laundry and Joseph would clap his hand over his nose, too young to be discreet. Rebecca ate soup and toast and drank copious amounts of herbal tea, and when Bronte brought a tray into her room, Rebecca would roll over and pretend to be asleep until her daughter had left. Bronte crawled beneath the bed one time and lay there, breathing softly, and Rebecca was torn. To tell her to leave would mean betraying the fact she was awake. But to say nothing and continue to lie there, mother and daughter trapped in a waking cycle of pretence and mutual animosity, was more than she could bear. So Rebecca sat up and pulled Bronte out from under the bed by the ear. Bronte left the nest at the age of seventeen. She had a battered black suitcase (left to her by Grandma Joan of all people) and the promise of cash when she needed it from her father. She found a room above a derelict dry-cleaning store and took up a smoking habit, using handfuls of cash she earned from dishwashing at a restaurant a few streets away. One night, the apprentice chef cornered her in the laneway behind the restaurant. The clouds were streaky across the night sky like spilt paint and Bronte felt the outline of the bricks in the wall digging into her back when he pressed against her, his mouth wet like a snail. Bronte’s hands went limp at her sides. She stared at him through apathetic eyes. He let go of her and dropped eye contact. Bronte readjusted the shirt she wore and hitched her handbag higher on her shoulder. She turned and left without a word. The next time he tried it – at a house party thrown by their work colleague – Bronte let him continue. Glasses of red wine had made her feel warm and smooth and supple, and their tongues were heavy in her mouth as he kissed her. The tan of his skin made her arms look like dirty snow. His breath was harsh in her ear as his grip tightened on her hips. Afterwards, Bronte lay on the rumpled bed clothes in the spare room, staring at the patterns on the ceiling made from rain-soaked plaster. Her fingers itched for a cigarette, and she wondered idly if she should walk home in the rain or stay over. A muffled, strangled sound brought her out of her wine-induced, post-coital haze. She stared at the apprentice. He was crouched on the carpet clutching his clothes. The bones of his spine stuck out like knuckles. Bronte stared at him without saying anything for a while, and then looked back at the ceiling. Perhaps intimacy would always be an unbalanced transaction. She wasn’t sure if that was the sort of thing she should know. Grandma Joan sat in the corner of the room, but Bronte ignored her too. What was the use of having questions when the answer couldn’t be articulated? When Bronte woke up the apprentice had gone, and the pre-dawn light was creeping in beneath the curtain. She dressed, pilfered some cigarettes from the handbags of her colleagues and disappeared out the front door. She padded across the grass in the dormant lung of morning, her breath making webs of fog in her lips. She didn’t realise she was walking to her parent’s house until she looked up and saw the street sign. When she reached the letterbox, she lit a cigarette and crouched down. The curtains were closed, the house cocooned in its slumber. Joseph’s bike was lying in the grass. Bronte sat and smoked until the sun was fully risen. She watched her family wake, the house come alive. She sat and smoked and watched as her father made breakfast and her brother did the dishes. Her mother sat at the kitchen table, reading.